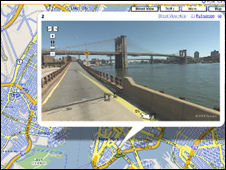 Google's plans to launch a mapping tool in the UK could be referred to the Information Commissioner. "In our view they need a person's consent if they make use of a person's face for commercial ends," said Simon Davis of the group. 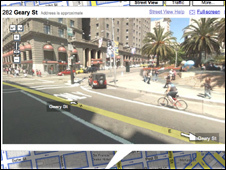 Street View has already been launched in the US and includes photos of streets in major American cities. Photographing of areas in the UK, including London, is believed to have started this week. Some individuals in the US have complained about their images being used and Google has said it removed their presence on request. The company has said it had begun to trial face blurring technology, using an algorithm that detects human faces in photographs. But Privacy International says it has doubts about the technology. It has written to the search giant and asked for technical information about the system. If the group does not get the answer it seeks within seven days, Mr Davies said it would write to the Information Commissioner seeking a suspension of the service in the UK. "We've spoken to Google in the past about this and received a snide response telling us to look more closely at their blogs. "We've been told by engineers at Google that the technology is not ready to be deployed." In the US it is legal to take photos of people on public streets. But Mr Davies believes that because Street View is being used for commercial ends anyone in the UK who appears in the photo needs to grant his or her consent. Google has said it complies with all local laws. In a letter to Jane Horvath, senior privacy counsel at Google, Mr Davies said that Google's track record on deploying technology designed to protect privacy was patchy. He said: "I recall the promise made by Google to the FTC [Federal Trade Commission] during the Doubleclick acquisition that "crumbling cookies" would be developed. "We have seen no evidence that this technology has been deployed. In response to concerns expressed at the time of our 2007 internet privacy rankings, Google also promised a "privacy dashboard" to help consumers understand the functionality of their user settings. This technology has not appeared." Privacy International has also asked Google about "the steps, if any, that you have taken to consult the public over the use of their images for what is, in effect, a commercial purpose". Mr Davies added: "Google likes to think of itself as a global player. In reality it is acting like an irresponsible adolescent. "It's time for the company to take responsibility for its actions and to do the right thing."